If you've been to Red River Beach in Harwich lately you might have noticed that construction is underway. So often, the sound of construction equipment means bad news for the environment, but not this time! 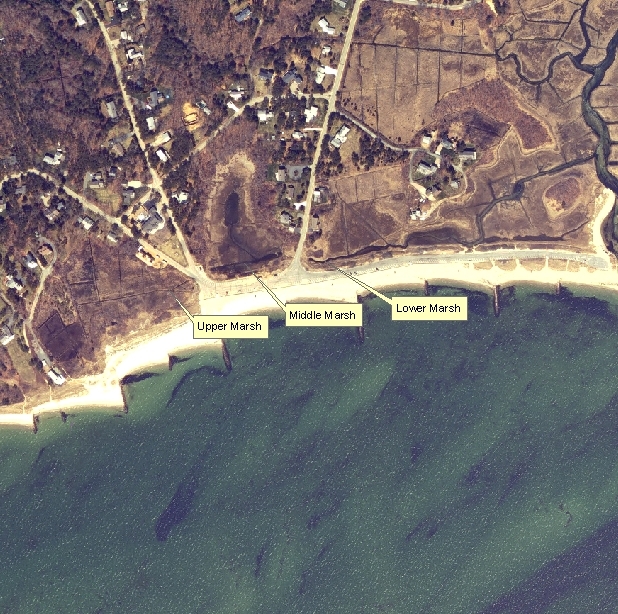 This construction was planned as a part of the Cape Cod Water Resources Restoration Project (CCWRRP) and, when completed, will help restore and protect the native salt marsh communities behind Red River Beach. Historically, there were three healthy salt marshes behind Red River Beach: the upper marsh, middle marsh, and lower marsh. As the tide came in, it moved up Red River and pushed tidal waters down a tributary to feed the marshes. However, when Uncle Venies Road and Deep Hole Road were extended to provide access to the beach, tidal waters were restricted. After years of being tidally restricted, the upper and middle marshes began to show clear signs of stress, including the establishment of invasive species such as common reed (a.k.a. Phragmits australis) and poor water quality. With funding from the CCWRRP, the Town of Harwich will restore the marshes to their former healthy state. To do this, the Town will replace the undersized culverts with much larger box culverts (4ft x 8ft under Uncle Venies Road and 3ft x 4ft under Deep Hole Road) that will allow adequate tidal flow to come in to both marshes and, in time, restore the natural salt marsh habitat and improve water quality.